Summary: Malin knows she can’t fix the big stuff in her life. Instead she watches from the sidelines, as her dad yells, her brother lies and her mum falls apart. At least after she meets Hanna she has a friend to help her. Because being Malin is complicated – learning how to kiss, what to wear to prom, and what to do when you upset the prettiest, meanest girl in school. It’s tough fitting in when you’re different. But what if it’s the world that’s weird, not you? I received an ARC of this novel at a bloggers event recently, and i did not catch my eye at first. I’d heard nothing about this story previously, and the general jist of it did not seem up my street anymore. However in the bid to complete my end of year reading challenge, i picked it up hoping it would be a quick read. 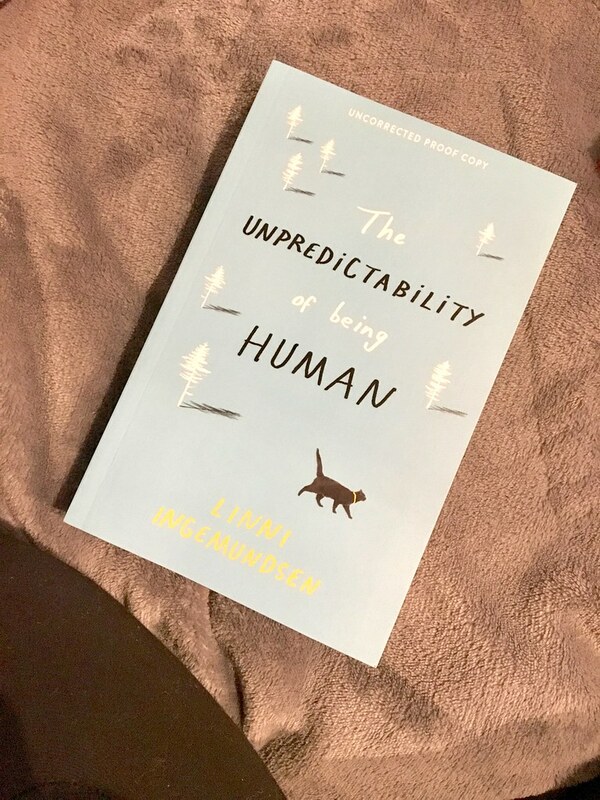 There are very few books this year that i’ve read in just two sittings, i did not expect The Unpredictability of Being Human (TUOBH) to be one that i added to that list. I finished this novel in just twenty-four hours of starting it, and that very rarely happens for me. There’s a certain innocence that i adored to this story and to our main character, Malin. Malin is fifteen and trying her best to fit in at school and figure out what the hell is happening in life. It’s a classic set up for a YA coming of age story. However, Malin has such an innocence to her character that i was not expecting. In someways (closer to the beginning) i found it a frustrating trait due to her starting the novel at the age of fourteen, quickly i found my feet with her character and found her to be charming and endearing. Malin knows very little about the world around her it seems, and seeing her come to terms with some of the facts of life with the dry sense of humour this book was written in was hilarious. There are definitely some laugh out loud moments in this. The writing style was not what i was expecting from a new author. It’s very brave, with a lot of short sentences, dry parts and moving on quickly from one event to the next. However, i think it fit very well with the characters within the story. This novel is the first from Linni Ingemundsen and i’d be interested to know if this style is kept up through future works with other characters. If you’re looking for a story with a lot of adventure, TUOBH is probably not going to be the story for you. It is definitely character based as it takes you through a lot of information about Malin’s family, her relationships with friends and her finding out who she is in the world. It’s a wonderful story, just not a lot happens! Some things about this novel did frustrate me a little. Certain aspects of Malin’s personality, some of her lack of knowledge of the world i found very unbelievable for her age. At the age of fourteen, teenagers are a little more aware of what is happening around them than Malin seemed to be. It read very much like Malin has some from of mental disorder, however nothing was stated so that is completely a guess from me. There were very few things that i could pick at and say i don’t like. I cannot wait for this novel to come out and for people to start reading it. I imagine it’s going to be well loved around the contemporary readers.